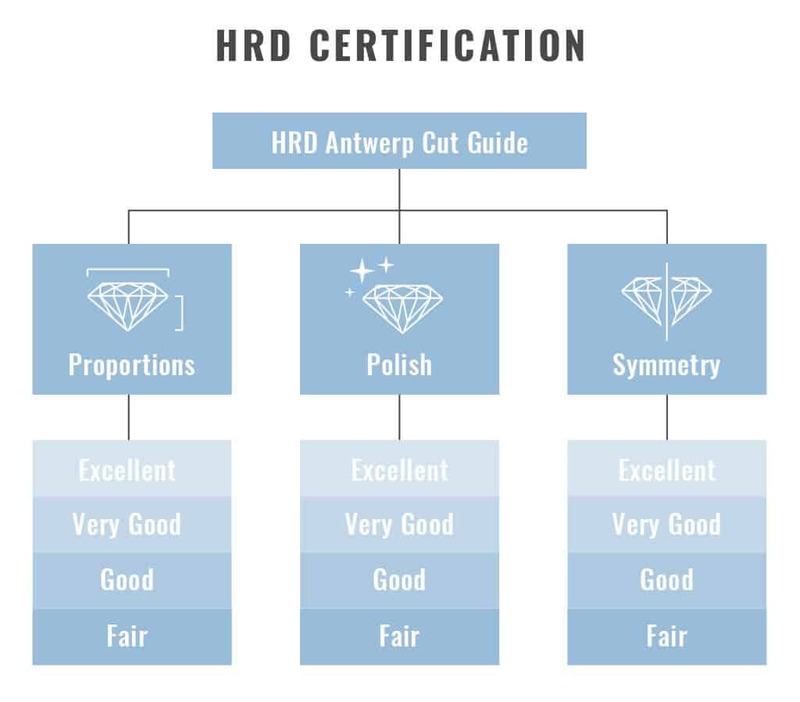 If you’re located in Europe and are considering buying a diamond that is certified by HRD, we suggest reconsidering. In almost every case, you’ll receive more value by purchasing a diamond certified by GIA or AGS from the United States and having it sent to you. Even if you have to pay VAT, the price you’ll pay locally already has that incorporated into the price anyway. James Allen offers free overseas shipping and great conditions for overseas buyers. Founded in 1973 as Hoge Raad voor Diamant, HRD issues certificates for diamonds and gemstones primarily in Europe. HRD is headquartered in Antwerp, Belgium and its chief shareholder is the Antwerp World Diamond Centre (AWDC). Not generally regarded as a legitimate alternative in the United States, HRD still claims to be the authority for diamond grading in the world. Over the years, we’ve experienced incredible inconsistency with HRD grading. They usually average about two Color and/or Clarity grades above the GIA’s grading. HRD graded diamonds are usually priced much higher than equivalent diamonds graded by the GIA. This allows for significant profits to be made by diamond companies. HRD provides a full report, evaluating each diamond on various qualities and components. When it comes to grading diamonds, the most important aspects to consider are the 4 C’s (Cut, Color, Clarity and Carat). Each C is graded on a scale to help determine the quality and beauty of a diamond. HRD grades Cut on a scale from Excellent to Poor. They also provide three subgrades: proportions, polish and symmetry. Proportions help describe the level of brilliance and fire a diamond will exhibit. Polish indicates the finish on the diamond’s facets. Symmetry describes how proportionate a diamond is in certain areas and parameters. A diamond’s Color is graded based on how white or colorless it is. HRD grades diamonds from D to Z, with D being the most colorless and Z carrying noticeable brown or yellow tint. The naked eye is usually unable to tell the difference between two adjacent Color graded diamonds, although the price difference can be significant. It’s important to review the diamond closely as well as review the Color grading. Carat, which indicates the weight of a diamond—not its size—is measured and reported on an HRD certificate. Carat weight measurements are standard across all grading entities. While Carat weight is important, the other C’s (Cut, Color and Clarity) play a larger role in the diamond’s overall beauty. In addition to information about the 4 C’s, an HRD report will include details on fluorescence, girdle size, culet, table width and finish grade. In our experiences (see below for more detail), the combination of HRD’s perceived clout and professionalism paired with their unprofessional and unreliable overall grading allows for significant profits to be made by the diamond companies. If an HRD graded diamond were priced the same as a GIA graded diamond of two lower grades, there wouldn’t be as much of a problem. But the fact is, this is rarely the case. So, if you are seriously considering buying an HRD certified diamond, please do some smart price comparisons first—and always assume that the diamond is equivalent to a GIA diamond of two grades (color and/or clarity) lower. In 2013, Rapaport published a now well known article entitled “Grading the Graders.” In the article, they performed an experiment sending 10 diamonds to 6 different labs. While we don’t fully agree with their methodologies (for one, they didn’t send the diamonds to other IGI branches outside of New York), their results comparing HRD to GIA and the other labs are telling. In that experiment, they assigned a numerical value to each Color and Clarity grade, going down by one point for every increased Color and Clarity grade. Over the 10 stones, the average grade for the GIA graded stones was 14.8 while the average grade for the HRD grades stones was 16.3—a difference of 1.5. In this experiment, HRD ranked below (in order) GIA, IGI and EGL USA. HRD only ranked above EGL Hong Kong and EGL Israel (two labs which are known to basically be fraudulent in the diamond industry). This experiment clearly establishes a bias in HRD grading in relation to GIA grading. Likewise, there was no consistency in the way HRD upgraded the stones over the GIA grades. Considering this evidence, we feel that you, the customer, must err on the side of caution to avoid getting swindled. As this Rapaport experiment establishes, it is not a given that an HRD graded diamond will have inflated grades when compared to GIA, but it is certainly the likely scenario. Since we care about each reader of our website, we cannot accept the position that only a “certain percentage” of you will get lesser value when buying an HRD certified diamond at a similar price to a GIA certified diamond. In our expert opinion, this scenario is likely enough that we must warn you, our dear readers, about it. Furthermore, our own experiment sending 4 diamonds to both HRD and GIA generated equally substantiating results. Out of the 4 diamonds, 3 received 2 grade upgrades (as we warned above), and one stone received a 1 grade downgrade. This is exactly what we claim about HRD: weaker overall grading and inconsistency. In light of such results, the only possible position we can take to protect you, the consumer, is to always assume an HRD graded stone is, in GIA standards, two grades lower than is claimed by HRD. The HRD grade bias in relation to GIA is well known and established in the diamond industry and is clearly reflected in industry pricing. Comparing the prices of GIA/HRD diamonds listed on the largest virtual marketplace for the wholesale diamond industry, Rapnet, confirms this claim. See below for the results using the Rapnet tool “TradeScreen” which aggregates pricing data of all of the diamonds listed on their service. Presented here are the tables by Color and Clarity for diamonds weighing between 1.00 and 1.49 carats, with no fluorescence, with all cut/polish/symmetry grades at the top of their respective scales. Prices are listed in dollars per carat. Of the 54 boxes in which there are comparable stones, only 2 are priced higher with HRD certificates than GIA. On average, the GIA stones are 13% more expensive than HRD certified diamonds. In financial economics, the efficient-market hypothesis (EMH) states that asset prices fully reflect all available information. There is only one logical explanation why the wholesale diamond market would price in such a consistent discount in HRD certified diamond prices when compared to GIA certified diamonds: the market knows HRD’s grades are inflated when compared to GIA’s. Otherwise, every diamond merchant would buy up these “cheap” HRD diamonds, send them to GIA, and make an easy 13%. If you’re considering an HRD certified diamond, we strongly suggest reconsidering. We recommend only purchasing diamonds that come with a GIA or AGS certificate. If you live in Europe, James Allen offers free overseas shipping and great conditions for overseas buyers. Any questions on purchasing a diamond? Contact our experienced experts.